With an overwhelming number of mobile devices available today, parents can struggle to keep their kids safe online and set rules for screen time. Even if parents don’t make mobile devices or home computer accessible to their kids, these pesky young ones will find other ways to go online, either from a friend, at school or even the library. From a cultural standpoint, technology in the hands of kids has become an essential part of modern social communication (i.e. texting to make social plans) and education, including school work and online learning. This makes it even more important to set up screen time rules and ensure kids know how to unplug. Because devices are so enticing, even adults have trouble unplugging (speaking from personal experience) and logical consequences may be needed at times to enforce rules. Like many parents, my husband and I struggle to discover what boundaries and logical consequences work best with screen time rules. If parents use a logical consequence that in the end can’t be implemented, kids won’t respect the rules. In our house, we frame tablet use as a positive reward for homework completion and we establish time limits. Our logical consequence when rules were not followed was taking away the tablets. The kids can always do homework on the family computers in public spaces such as the family room. But on the down side, when we took away their tablets our kids could not read their e-books or listen to their audio books. A few days ago all the moons aligned and I finally found something that works for one of my most tech addicted sons. I have 11 year-old twin sons and one of my twins, J, just started following our family screen time rules including no screen time at bed – reading only. I even purchased both of my twins Amazon Kindle Paperwhites to do their nightly reading. The Amazon Kindle HD Fire’s parental controls are very robust. We choose the Kindle Paperwhites because they are so light, have a great screen for reading in all conditions and the charge lasts for a few weeks. My tween son J was able to actually put down his tablet before bedtime when asked and read books on his Kindle Paperwhite. The ability to manage his own screen time is the goal we have worked toward since they were little. His twin brother, D, had trouble putting his tablet down to read and we tried many other strategies. We had him listen to audio books from Audible at night for bedtime reading, and he went through tons of different chapter books until he said he wanted to go back to reading the books. But D could not resist the temptation to watch YouTube videos at night instead of reading (mostly STEM, minecraft, harmless cartoons and other age appropriate videos). So last night I did what years of learning emotion coaching from the fabulous TheGoToMom Kimberley Clayton Blaine inspired me to do: without emotion, I told my son D at bedtime that he has not shown me he can comply with screen time rules and I am taking his tablet away at night. I also told him that I am only returning it temporarily for his daily hour of screen time. TheGoToMom’s emotion coaching really helped me understand the next thing I did: walking away! Before my son could resist, yell, debate or plead for his tablet back I just walked out of the room and put the tablet where he could not find it. It was the logical consequence that felt right and I decided to go with it. This technique was extra difficult because my son has a hip injury and is on crutches. He actually got out of bed, grabbed his crutches and followed me from room to room begging to return his tablet. I felt so guilty inside, but TheGoToMom helped me learn that I need to not engage, just calmly say “you will get your tablet back tomorrow, now it is reading time”.. The image of him using his crutches to follow me around while I was cleaning a few different rooms made me want to give in, but I had to keep a straight face and stick to my logical consequence or else I knew it would never work. What happened the next morning can only be described as magical. The night before he finally got tired of chasing me around in his crutches and went to bed – AND READ… Then he told me he work up early and READ MORE before going back to sleep. When he got up he READ AGAIN. I gave him a big hug when he told me and I said “for now on, I will hold your tablet a night and you can get it back during the day”. D said “OK” and I felt that exhilarating feeling you get as a parent when you see your child taking responsibility and embracing something he needed to do for his own good. I know that we will go through more screen time challenges in the future, but for now – all is good. Step 1: Create family screen time rules. For reference check out Common Sense Media’s section on screen time. In my experience, it is important to create rules that the whole family can follow (and parents can enforce) – so try to be realistic. For example, because we have all of the family desktops in public family areas, my kids use their personal tablets to check homework websites for school when doing homework in their bedrooms. So a regular rule that includes not tablet use at night would not work. But we do have a rule that tablets can only be used for reading or homework after 8pm in their bedrooms. We also have a rule that our kids can have one 30 minutes of screen time after school, then they need to finish their homework to earn more recreational screen time (if time permits). Another important point is to define what websites are “appropriate” for screen time. My tween sons can only play Minecraft, STEM websites such as Scratch, sports and other video games rated for their age while my 16 year old can play teen rated video games for his screen time (in a room away from his brothers!). We also have a family rule that states that exercise or sports before screen time! If my boys don’t have organized sports that day, they can play any sport such as a quick game of pickup basketball. But for one weekend morning, they can watch cartoons above and beyond the regular screen time rules. I find it helpful to print out the family screen time rules and put them next to family desktops and in my kid’s bedrooms. 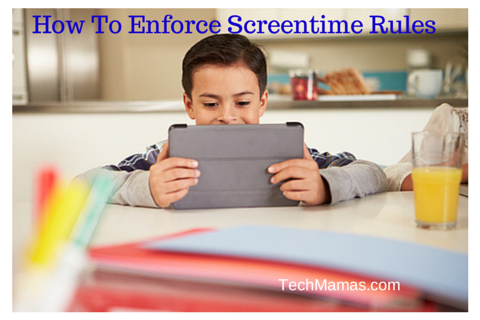 Step 2: Decide on how to enforce the screen time limits/rules. Create appropriate logical consequences and positive rewards. I have found positive rewards always works better than consequences, but at times logical consequences are needed. For example, my kids “earn” their screen time for doing their homework and doing outside play/sports times each day. At the same time, they may have trouble sticking to the screen time limits so that is when we have logical consequences (like taking away their tablets for a day). When my kids were younger I set up web filters to limit their access to websites. But now that our kids have access to computers at school and friends with smartphones, we have more open access at home and regular discussions about internet safety including the consequences of visiting inappropriate websites. Along with the logical consequences of losing screen time, we have regular talks with our kids about the serious dangers that exist online. Some families I know needed to put more serious logical consequences such as closing down home WiFi access only on an as needed basis. Home WiFi access can be controlled with parental control software or on the home router controls. There is also a great selection of parent control software that can be used across home devices and computers (which I will post on another time). Step 3: Make a promise (to yourself) to always keep emotions in check and set up system to support that. For example, when I enforce the consequence of taking my kids tablet away I either do it when they are asleep or now that they are older I calmly explain that they have not complied with the screen time rules so I am taking their tablet away for (“x” nights or days etc). I feel it is important now that they are older (11) they see me taking their tablet away as a logical consequence. When they were younger their reasoning was not as strong so I just took it away when they were asleep. To keep my emotions in check after I take the tablet away and to not engage in emotional debates or pleas, I always walk out of the room and then decide on a household chore to start doing. That way, if they want to follow me around I will just focus on my household chore to remain calm. Sometimes I left the house to go for a jog, giving myself a necessary exercise break. For more information, check out Common Sense Media Screen Time section. For information on choosing your kid’s first phone (which if it is a smartphone – will have access to a web browser), check out my post titled “Top Tips: Choosing First Phone for Kids“. 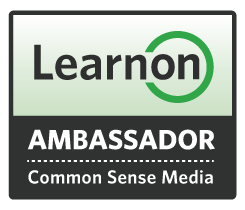 I am excited to be a volunteer as one of the Common Sense Media Learn On Ambassadors.